This is a rare bit of intriguing news. After my first couple years of ignorance-driven winter reading about “all this stuff”—organic vs conventional, Big Ag, the various action groups and campaigns—I tired of much of it. Increasingly every year, I find that building the tiny (organic) farm and, well, ignoring much of the rest, seems to make more sense than being cause-driven in any organized way. So far, I haven’t had the urge to join a Movement or head for the rally. This farm is certified organic, although I have mixed feelings about that whole side. Perhaps it all has to do with a mistrust for people trying to convince me of things on principle… Or faith. I mean, the food difference is pretty obvious if you get a chance to see for yourself. If you’ve eaten really fresh, garden-grown food, the typical, mass-produced supermarket veg is simply something else entirely. Clearly, it’s not like the difference between a good cook and a bad cook using the same ingredients—a matter of taste—it’s DIFFERENT INGREDIENTS. It took me less than one season to realize this, with some rather mild shock (how surprised can you really be, looking around at everything else? :). Anyhow, while clicking around for more news of this study, I was reminded of Lady Eve Balfour and her Haughley Experiment, the first Western science-based, side-by-side comparative study of organic vs conventional. I’d read about her—and her book is online—in Year 1 or Year 2… She started Haughley in 1939, and it ran for 25 years. It’s well worth the time to read her address from 1977, summing up the findings. The picture of the living soil it paints is…really cool (particularly if you farm or garden, because it’ll probably make instant sense). Unless you’re living in a wordless world, this is a little collection of gardening words that’s useful to know! It’s not common sense. Quite the opposite in fact. Organic plants have to fight insects, fungus, mold, and will most likely be competing much more heavily with soil bacteria for nitrogen than their inorganic counterparts. It’s like suggesting that people would be more healthy if they didn’t take inorganically derived antibiotics when they got sick, or washed their bodies with antiseptic soaps to not get sick in the first place. Synthetic stuff is just good. Good for people, good for plants. That’s why they make it in the first place. What organic growers have going for them is usually a local market where shipping is not the overriding concern–thus varieties that don’t ship well can be grown and the produce can be fully ripened(allowing for more nutrients). I’d guess that any nutritional differences lie there–in that large scale agra has to grow crops that ship and can be picked early. If I were a grower though I’d have to be labelled “fairly organic”. Sometimes you have to bring out the antbiotics. That makes a lot of sense, Steve. Having tried gardening both ways though, there is simply no comparison between the two methods of gardening. At least when you are growing vegetables for family and friends. With inorganic fertilizer and the occasional zap of pesticide/fungicide, everything grows larger. Everything grows faster. Everything produces more. Everything has a better, cleaner, consistent color. If you are willing to cut out the blemishes, remove the bug stings, etc., organic vegetables taste just as good as their less natural counterparts. That is small praise though, considering how much longer you have to work in your garden to produce them. This is probably not true in the colder climates you may inhabit, but down here in bug-central, organic gardens have no place. Kevin: Thanks for the extended comment! The organic debate, argument, whatever, has gotten pretty tired, I agree, confusing and overdone in the media, many people set in their beliefs and waiting for Something Big to happen before considering change. 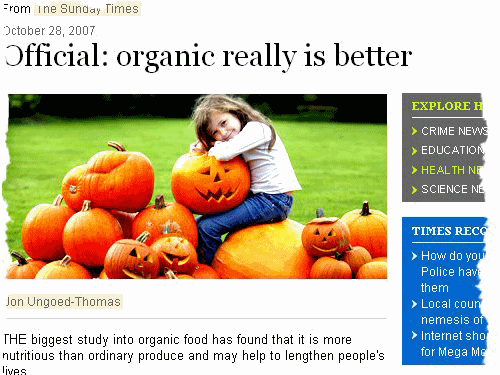 My remark about common sense referred particularly to what the “organic really is better” article seemed to be reporting, that the composition, and therefore the nutritional value, is markedly different between conventionally and organically grown food. This makes sense to me if the conventional stuff relies on being blasted with a limited range of nutrients, while the organics are drawing their nutrients from soil that is producing the whole range of nutrients that healthy soil can produce (or in the case of livestock, from plants raised in healthy soil). If “you are what you eat” applies to people, doesn’t it apply to the plants and animals people eat as well? That seems like a common sense conclusion. As for the learning in my first year, I was totally urban core big city, and never gave gardening much thought. The “soil” was something you stuck in a pot to stick a houseplant in, and then you fed the plant. I’m not totally stupid, just never had a reason or opportunity to see stuff growing. And once I saw how plants did grow, the “organic way”, without the synthetic NPK fertilizer that I’d first thought was critical to agriculture, the rest of what I was reading about organics seemed to hold up and to be…common sense. That’s what I meant…sorry if it wasn’t all that clear! I don’t know about gardening down south (all in all, I only know a little, mostly just what I’ve done myself on this couple of acres), but one of the first organic farms I found when I started learning about micro-farming was Fairview Gardens near Santa Barbara, CA. I dunno if you consider that south, but it’s way south from here. And it seems like an amazing (organic) farm…where it’s nice and warm!